The fifth in the world-renowned series, this programme visits not only some spectacular koi ponds, but also some highly knowledgeable and experienced koi keepers, people who can offer a great deal of advice to hobbyists at all levels. People and ponds such as these are actually very few and far between and we can all learn much, not only from what they tell us, but also from simply observing the systems that they manage. This volume contains a great diversity of pond systems, together with people from all spectrums of the hobby, from active section members through to those who choose to enjoy their koi away from the spotlight. Another highly informative and enjoyable DVD from the award-winning New Vision team.? 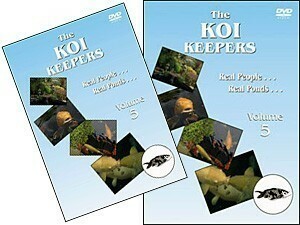 With over 40 programmes about koi to their credit, they are the world leaders in professional, interactive aquatic titles. Producer: New Vision Videos.? PAL (Region 0) format.? This DVD will play in all computer based DVD drives, and most home DVD players.